Visit Bernie Sanders’ website (BernieSanders.com) and you will quickly realize he has seriously progressive plans to help protect older Americans and the disabled who survive thanks to pensions. Sanders’ plans will strengthen and expand Social Security—and also safeguard it from Wall Street. In contrast, while Hillary Clinton promises to preserve Social Security, her position is compromised by her acceptance of money from Goldman-Sachs and other financial brokers. According to the Universal Declaration of Human Rights Article 22, the concept of social security is a basic human right. Whether they are elderly or disabled, humans deserve to be recompensed for the years they were in the labor force after they retire or become disabled. Social Security and other New Deal programs did not come without struggle, despite the fact that Depression-era President Franklin D. Roosevelt signed the bill into law in 1935. None of the past social gains of the working class now under attack were handed down as gifts…Social Security and the other New Deal Reforms were granted only after general strikes shook cities across the country such as Toledo, Minneapolis and San Francisco. President Roosevelt initiated the New Deal as a capitulation to millions of radicalized workers. These workers saw how the ruling class made remarkable gains while they continued to live and work under impoverished slave-like conditions. The New Deal initiated labor reforms, such as minimum wage, overtime pay, and child labor laws. However over the next decades, workers were forced to continue to strike for decent pensions, health care, and workplace safety. It’s a fact that the Republicans and also some Democrats want to end Social Security. Thanks to foreign wars and austerity measures, Social Security is on the chopping block. Not bankers and merchants but multinational corporations…want to defund Social Security (and other programs), then eventually when it becomes problematic, it is privatized. Republicans backed by special interests have been at the forefront of advancing the myth that Social Security must be defunded because it is no longer self-sustaining. The roadmap for taking cities and companies into bankruptcy was set through counter-social revolutionary attacks. For instance, Detroit’s finances were compromised through a complex series of predatory interest rate swaps and loans foisted on the city by Wall Street bankers. Bankruptcy firm Jones-Day then offered a plan that would enact adjustments that would gut savings and shed workers. The plan was rapidly executed by emergency manager Kevyn Orr from Jones-Day granting him extraordinary control over all Detroit financial matters. Any city or state can use federal bankruptcy laws to strip workers of the benefits they earned during a lifetime of labor, even if a state constitution such as Michigan’s explicitly protects their pensions. Laborers’ assets and earnings are then handed over to the consultants and bankers despite the fact that those banks may have already benefited from huge government bailouts. Since the 1980s company-paid for pensions for private workers have virtually disappeared, however a vast majority of public employees are still covered under guaranteed pension plans. Whether Republican or Democrat, highly-connected political operatives are continually looking for ways to slash public pensions and other retirement benefits. In spite of the fact that under the Obama administration 95 percent of all income gains have gone to the richest 1 percent, billionaires want to steal the trillions of dollars in pension benefits owed to workers. Senator Bernie Sanders along with other bold progressive Democrats support strengthening Social Security. Their plan includes Expanding Social Security by lifting the cap on taxable income above $250,000. By having those who earn more than $250,000 contribute the same Social Security tax rate as those below, the additional Social Security infusion will help with cost of living increases. In other words, there would be at least four ways to supplement the meager incomes of workers living on Social Security, by ensuring its longevity, by affording pay increases, and by increasing total payments for seniors who are living well below the poverty line. A demographic breakdown of the differences in numbers among those affected is provided by the Center for Economic and Policy Research which indicates that less than six percent of workers would be affected. In contrast, while Secretary of State Clinton’s plan will increase payments to widows, and provide compensation for workers who are providing care-giving, Clinton’s plan is generally much more on the defensive side for maintaining the status quo. In fact the Progressive Change Campaign Committee (PCCC), concerned that Hillary Clinton may back off once she is elected, is promoting an ad campaign for securing a promise. It is an absolute must for a Democratic nominee who claims to be progressive to say clearly and unequivocally that they will never cut Social Security benefits. Bernie Sanders has made that commitment. Hillary Clinton should make that commitment before the New Hampshire primary so Democrats can focus on expanding benefits. Jerry White. “The Detroit bankruptcy ruling.” Exposing the Bankers’ Conspiracy. Oak Park, MI: Socialist Equality Party, 2014. 7-10. Print. Dr. Chomsky qtd. from Lecture on “Global Hegemony: The Facts, the Images” in “Ways to Save Social Security.” chriswong’s blog. Asian Pacific Americans for Progress, 03 Aug. 2013. Ibid. Exposing the Bankers’ Conspiracy. Oak Park, MI: Mehring Books, 2014. Bernie Sanders. “Strengthen and Expand Social Security.” Issues. BernieSanders.com. “Huff Post: ‘Hillary Clinton refuses to rule out any and all benefit cuts to Social Security’.” Progressive Change Campaign Committee, Bold Progressives.org. 05 Feb. 2016. 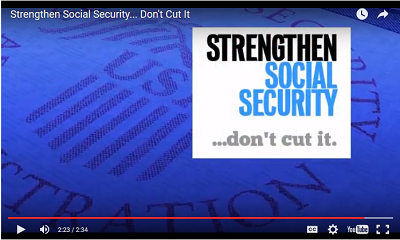 Strengthen Social Security…Don’t Cut It. Produced by Agit-Pop Communications. Video. StrengthenSocialSecurity.org. Web.